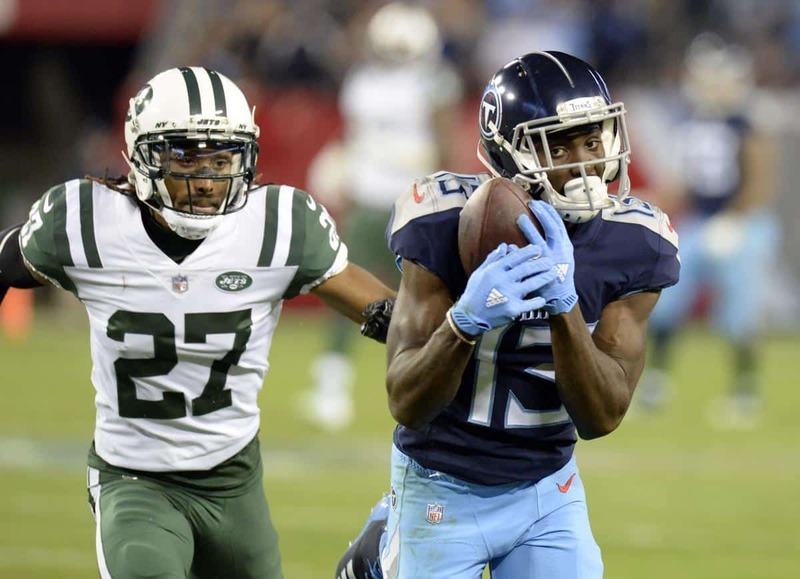 With the playoffs on the line, the Tennessee Titans trailed the New York Jets 16-0 in the 2nd quarter. Everything went wrong: an interception returned for touchdown, a blocked punt, a blocked extra point, a shanked punt, a long kickoff return given up, and a bad fair catch call. Despite all of this, the Titans found a way to comeback and defeat the Jets, 26-22. Titans QB Marcus Mariota (#8) had a historic night for accuracy and efficiency last week with 96% completions for 302 yards and 2 touchdowns. The follow-up performance couldn’t have been more opposite. Mariota began the game with an incompletion and interception returned for touchdown. Throughout the night, Mariota struggled with his accuracy missing usually easy throws. By halftime, Mariota has posted one of his worst halves of his career. Things changed in a big way in the second half. Mariota threw for over 200 yards and a score in the second half alone. He would complete the masterful comeback (his 12th game-winning drive of his career) with only :36 left in the game as he found WR Corey Davis (#84) on 3rd & 7. The crowd went wild. Social media was buzzing excitement. Mariota would finish the game 57% completions for 282 yards, 2 touchdowns, 1 interception, and 43 rushing yards. Through the last two seasons, Marcus Mariota leads the NFL in game-winning drives. If you give the ball to Marcus Mariota at the end of the game, he’s gonna win it for you. It’s the 4th law of physics. Corey Davis is developing into a trusted target for the QB as well. The current AFC Playoff race is a log-jam for the final Wild Card spot. There are currently five teams fighting for one spot: Baltimore Ravens (7-5), Miami Dolphins (6-6), Indianapolis Colts (6-6), Tennessee Titans (6-6), and Denver Broncos (6-6). At this point, it seems the TItans will need to run the table in order to make the playoffs. Up next for the Titans is a divisional matchup against the hated Jacksonville Jaguars who after losing 7-straight games just upset the hot Colts. Titans fans won’t have to wait long as this week the Titans host the Jags on Thursday Night Football. Can the Prime Time Pineapple keep it rolling?